St Austell may be a point on the compass unfamiliar to many around the world, a town of some 20,000 souls nestled on the picturesque south coast of Cornwall. While its original sustained economic prosperity was due to clay mining, today the town is best known as a tourist destination and, for beer drinkers with a keen sense of what’s temptingly tasty, there’s St Austell Brewery. Founded in 1851, the brewery prospered to the extent that as of 1893 it relocated to its current location, prominently hilltop above St Austell. The brewery was situated about a mile uphill from the new railway line that gave it access to markets further afield than Cornwall’s environs. As it approached its 150th anniversary in 2001 St Austell remained a dedicated purveyor of cask ale, brewing three times a week and producing around 16,000 barrels (26,200 hectolitres) annually. And it was a largely unautomated brewery, one dependent on the variability of manual processes. Today, almost 20 years later, the story has played forward at pace. St Austell has kept up with the accelerating trends in the brewing industry – and in many ways surpassed them. Under the leadership of brewing director Roger Ryman, St Austell’s growth is being powered by a number of increasing popular beers launched since his arrival in 1999. Tribute, a characterful premium ale, was the first to gain prominence in the brand portfolio. It has been joined recently by Proper Job, a session strength IPA with oodles of citrus hop character. And then there’s Korev, St Austell’s own lager brand launched in 2009 that has achieved the near impossible, gaining sales against lagers backed by the considerable marketing spends of multinational brewers. St Austell has also distinguished itself from its regional family peer group by acquiring a near-by craft operation, Bath Ales, in 2016, subsequently announcing plans for a greenfield 60,000 hectolitre brewery that began production in May 2018. Currently at St Austell the brewery is producing 130,000 barrels (213,000hl) annually on a 24/5 shift pattern. While cask ale still accounts for 50% of volumes, keg (17%) and bottled beers (30%) are driving growth, with cans starting to enter the mix. None of this would have been possible without investing in the brewery and, when possible, preferring the latest in brewing technology. For St Austell high on their must have list was membrane filtration. It had been on Ryman’s radar for some time, with neighbouring cider makers making use of the technology for years. In 2017, Pentair brought to market a BMF range with hourly capacities between 60-85 hectolitres designed for brewers with annual outputs as low as 10,000 hl up to 120,000 hl. Ryman recalls, “As soon as we saw that this was a viable option for us it was something that we were very keen to do.” And so following trials, in early 2018 Pentair’s 60 hl/h BMF + Flux Compact S4 came into service. For Ryman there are broadly three areas in which membrane filtration benefits – environmentally, with a move away from DE filtration; improved product quality; and accruing process savings, in terms of reduced inputs and operational gains. Membrane filtration replaced St Austell’s use of a Diatomaceous Earth (Kieselguhr) filter, in so doing offering immediate environmental improvement. As Ryman highlights, “It is about health and safety. Powder is not nice stuff, as we know.” Moving to BMF eliminated the oft-times messy requirements for handling powder and the environmental impact and costs of disposing of DE powder. What’s interesting, here, though is that in moving away from DE in Ryman’s thinking that there is a direct gain in product quality. Beer membrane filtration is already credited with improving the shelf life of St Austell’s beers. The brewery’s taste panel is of the opinion that there’s a noticeable difference in flavour stability. There’s also been a noticeable reduction in beer losses from filtration. Ryman estimates the gain at between 1-2%, a considerable advantage given the volumes being processed. More than this, BMF is providing considerable process gains, both operationally and financially, immediately upstream and downstream. With DE filtration St Austell has been using a centrifuge, which meant operating a two-tank system. BMF made it possible to eliminate use of the centrifuge and move to a unitank system, resulting in reductions in processing time, CIP and CO2 consumption, with the CO2 having been used to displace tanks on transfer. With St Austell not pasteurising its kegged and bottled beers, use of Pentair’s BMF has also resulted in substantial gains in final filtration. There was one other factor that figured significantly in St Austell’s opting for Pentair’s compact BMF solution. Pentair offers a leasing option, where the brewer pays a set fee for each hectolitre of beer filtered, thus providing calculable cost certainty and a reduced capital expenditure requirement. St Austell’s partnership with Pentair originated well before its interest in membrane filtration, dating more than ten years when the first of what were to become many Südmo valves were installed. Ryman recalls, “When I joined the business there were no automated valves in the brewery at all. Everything was with manually controlled valves. So, gradually as we’ve automated the process, we needed to have automatic valves control the processes and our valve of choice has been Südmo. An area of further co-operation is potentially a CO2 recovery system. Recent CO2 shortages in the United Kingdom have highlighted St Austell’s geographic vulnerability. 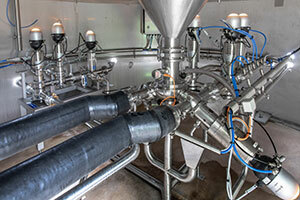 Along with the attractiveness of self-sufficiency there’s also an environmental gain, with the amount of CO2 recaptured from fermentation equivalent to the requirements of the packaging line. 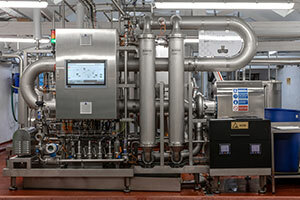 More immediately, St Austell has been so impressed with the results of beer membrane filtration that it has acquired a second identical Pentair system for its new brewery in Bath. It was an easy decision to make. This entry was posted in News and tagged Beer Membrane Filtration, CO2 Recovery, Process Valve Technology. Bookmark the permalink.